1. Boil spaghetti as directed on package. Drain. 2. Meanwhile, brown chicken breast until tender and done all the way through. Shred chicken into bite-size pieces. 3. Melt processed cheese spread in a microwave oven as directed on jar. 4. Pour drained spaghetti in a large baking dish. Add melted cheese spread and soup; mix well. Stir in chicken, and mix well. Cover with foil. 5. 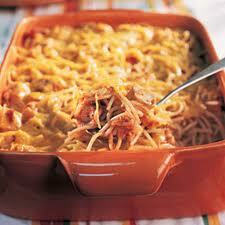 Bake at 425 degrees F (220 degrees C) for 25 minutes,..and the chicken spaghetti recipe bake is ready to serve...nice one ! Enjoy it!